It has a 700-watt motor and a big bowl with well-designed dough hooks (& whisk beaters) that can make BIG batches. This is great for our family of six, and also for anyone who likes to make big batches all at once like I do. Shredding cheese is so easy now! They also carry accessories that you may want to add on later. I bought mine with the blender attachment, and also the slicer/shredder. It was between the slicer/shredder and the food processor, but the slicer/shredder had a much bigger bowl. If you already have a Bosch, comment below and tell us what YOU love about it! My other favorite kitchen gadgets. Need some new main dish meal ideas? I can’t access the site. Dennis, which site do you mean? After 8 years do you still LOVE, LOVE, LOVE your Bosch mixer? My mixer is about 12 years old (the company replaced it 2x in the first 18 months due to defects) and is slowly wearing out. I am doing research now so when the time comes I am ready for purchase! I really do, because it’s got SUCH a big bowl AND a lid. The KitchenAids are so pretty, but the bowls look small and no lid, so stuff would splatter out! I bought a bosch universal bread mixer last year and use a Nutrimill to grind my whole wheat for flour. I am having a problem with the bread being dry, very compact and only makes 4 small 2 lb loaves of bread. I use the Red Star Yeast from Costco, keep it in the freezer and don’t use beyond the recommended date. I use the “sponge method” I got off the bosch website. I don’t know if it is the wheat I am using or the mixing that is the problem. I just read the reviews above and will try soaking overnight and adding the lemon juice someone mentioned. I would appreciate any information that will help my bread making experience. Thank you. Elaine, are you using 100% whole wheat flour? I’ve only had good results using part whole grain flour and part unbleached white flour. Try 1/3 white and if that’s not great still, you may have to go 1/2. If someone likes dense loaves, then 100% whole wheat is fine, but my family still likes it lighter! It’s funny how bread dough reacts to differing weather. The same recipe will take different aounts of flour depending on the humidity and temperature. I always just add flour in until the consistency is correct. If my dough is sticky, and I don’t want it to be(some of my sourdoughs are more ‘sticky’ or wet), then I start with less water/other liquid. If there are fats (butter, oil, etc) then those will contribute along with eggs. Another factor is sugar. Generally the yeast (if you are using some) will need a boost, but not a lot of sugar. Sweet doughs use more, but ought not to be too sweet. The sugars also contain water/moisture. So starting with less liquid will minimize this, but then you may need to adjust by sprinkling a bit more liquid in to make the dough the right consistency. Time and practice will help, you will get a good feel for this. I just got mine a month ago and now I am a bread making crazy lady I do have a question. I have used the white bread recipe from the book that comes with it with great success TodayI decided to do another large batch. But my doughis way too sticky toEven work with. I can’t even roll it out for cinnamon rolls. Can it be saved at this point I even ended up using all 16 cups of flour Did I knead it too much. If anyone knows a solution I would appreciate it Love your blog :-).?..,. I love, love, LOVE my 22-year-old Bosch. Well, except for one thing. I have a difficult time removing the bottom of the blender container for cleaning. Any suggestions? I am wondering what appliances the Bosch would/could replace in my kitchen? Specifically my kitchenAide mixer, bread machine, and even my Blendtec? Thanks in advance for your advice. Yes to the mixer and the bread machine, and I had to look up what a Blendtec was but yes, the Bosch comes with a blender, too. You can also buy attachments so it can be a food processor or a chopper/shredder. I got a chopper/shredder (it makes the work so fast!) because I already had a food processor. Last year my mom was out garage saling for me, and she called to tell me what she found. As she was going through things, she said that she saw a Bosch food processor thingy, but didn’t know if I needed it… I asked questions, and she didn’t know the answers. Finally, I said, “Was it heavy?” When she said yes, I said, “Oh, my! Please go get it…” She did… 🙂 It is the older Universal, but came with the stainless bowl, dough hook, the food processor, and the whips. She got it for $25. YIPEEE! I was on cloud nine. This year hubby got me the grain mill and blender~~~ I love my Bosch!!! I agree. I have made some amazing finds at resale shops and yard sales, but this was so good, I nearly cried. I have used it hard, and it hasn’t let me down. If and when it does keel over, I am heading straight for the new version. I would still like to get the cookie paddles, but so far I do well using the plastic bowl and whips then switching to the stainless bowl and dough hook to get my cookies made. Kelly, I want to thank you for the recommendation of the Bosch! I was on my second KitchenAid and it was beginning to give out when I found your post. I’ve had it for about a year now and cannot possibly praise it enough! Didn’t find the Bosch at the link you list so I found it elsewhere. It’s great! If at first you owned a Bosch would you then go and purchase a vitamix? Are they complementary to each other and if you could afford it then have both? Or are they redundant? I am feeling a bit bummed that maybe I should have just purchased a Bosch. The blender on the Bosch Is great & does anything I need it to. If you were planning on getting a Bosch anyway, at least get that first (maybe take the VitaMix back for now?) & see later if you still want a VitaMix, but I really doubt if you would. I have had the Bosch for over 32 years and with two adult sons at home both into physical fitness and wanting top nutrition I recently bought a Vitamix. We were using the Bosch blender for smoothies so my Bosch machine was going four to six times a day. I did not want to wear out my “baby”. We found that the Vitamix is the ultimate for smoothies – it compliments the Bosch in the nutrition side of things. I found that the Vitamix also replaces my Bamix – no need to pre-grind the flax seeds. Both machines are my ultimate kitchen must haves. My boys rave over the Vitamix every day! One son had bought a Ninja which we have now packed away – It worked but left seeds and chunks unblended. I also have a Nutrimill flour mill but bought the dry container for the Vitamix for making nut butters. The dry container is for grains but the Nutrimill does the exact grind required. I was also planning on using it to grind coffee but I read that a burr coffee grinder is the best for that job so I bought a Burr Coffee Grinder to get an exact grind. Various grinds are needed if yo are using a coffee press, percolator or a drip coffee maker. If you are going to do something you may as well do it right! Someone had a question about cleaning the blender – it is hard to take apart but when we did it kept opening while in use leaving the whole shake spilled all over – the Vitamix does not have to be and cannot be taken apart. If you don’t clean the Bosch blender the rubber gets yukky and sour. I have a Stainless steel Bosch mixing bowl and I use cold water and soap for washing – I was glad to find that tip as warm water leaves the dish brush very gummy like glue. I then rewash with hot water and rinse. Sue Gregg has a really good bread recipe and it tells you how to soak the grain/flour the night before. Taste great and really soft bread. What attachments do you have? I’m thinking about getting one of these and just wondering how many extras I should plan for. Thanks! Do you still recommend this? My Kitchen Aid is not cutting it. Hi Marmee, on your DVD is your recipe for a *soaked* loaf (the most nutritious)? Otherwise, readers could use sprouted flour, but that usually needs some recipe tweaks. I have produced an hour long DVD on using the BOSCH mixer in my own kitchen and my favorite and easy recipe for fluffy whole wheat bread + Best Bread that has a little unbleached bread flour added for those who are too picky to try 100% whole wheat at first and lots of explanations about flours, grains and a demo using the kitchen mill (WonderMill) and yummy ways to make garlic cheese braids, teddy bears with honey-butter glaze and even Catapillar Rolls! I’d be glad to send anyone interested in getting a BOSCH a FREE DVD! They retail for $16.99 at my webstore but it would be worth it for them to be able to see it in action in their own homes and everyone doesn’t always know someone next door who owns their own BOSCH. Just shoot me an email at [email protected] and I’d be more than happy to send anyone who reads your blog a FREE DVD – no strings attached! I have the bosch uniersal and ther bosch concept. 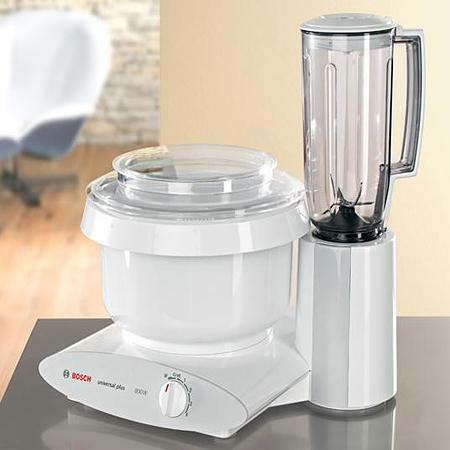 The concept blender is not as fast as the universal blender since it shares the drive with the mixing bowl, which means smoothies take a couple minutes to get smooth whereas smoothies in the universal take only several seconds. But, I like the concept for bread because it doesn’t move around on my counter. I have to hold onto my universal mixer when making bread dough or it may fall off the counter. I make sourdough in them but am going to try making all sprouted eziekel type bread with no yeast. I hope I can get a good recipe figured out. I’m shooting for Monday, Wednesday at the latest! If I wasn’t so picky about my posts being just right, it would be done by now! And I’m going away this weekend so I’m getting ready for that, too. Sorry it’s taking me longer than expected! It will be worth the wait, though, I promise! Yes, Please do send the soaked grains recipe as soon as you can. I try as much as possible to adhere to Sally Fallon’s advice about doing this with grains in her book called Nourishing Traditions. She expertly exlains that all grains have naturally occuring enzyme inhibitors that block nutrient uptake in the body, but that soaking the grain breaks these inhibitors down. Send out that recipe!! Please!!!! The recipe I got from Shauna was SO good (before I started messing with it so much, anyway), that it froze GREAT. Right out of the freezer it was just as good as when it was fresh – soft and yummy! I’d guess that freezing the dough before it rises would be fine, though. Nice warm bread from the oven is always a treat. Maybe I’ll try that with my next batch and let you know. I would love a whole wheat bread recipe that I can freeze the dough, to bake loaves later. I use the urban homemaker’s recipe, but the dough didn’t freeze too well. I read to freeze it after the first rise and before the second, but hers only has one rise, so I wasn’t sure what to do. I hate having to make bread every day, but freezing the actual bread, makes it dry and crumbly. The online store I have linked to also has great customer service, I have spoken on the phone to the owner several times and he’s awesome! I just bought a Nutramill and Bosch mixer a few weeks ago. I LOVE THEM! Making dough is so easy now. As far as soaking the flour goes. I do it a little differently when making bread. I follow the dough recipe, add a little lemon juice and refrigerate the finished dough overnight. The lemon juice helps to break down the phytic acid. If you are using a sourdough starter you don’t need to add it. Before I shape my loaves I allow the dough to warm up for an hour or so. It turns out great. By the way, I purchased my Bosch from an certified dealer in Ohio. She is actually a retired missionary and a huge NT advocate. She has the same great deal that some of the on-line stores are featuring. I’m not sure if I can post her website here, but let me know, Kelly. What is great about working with an individual like this is the customer service. She doesn’t mind lots of phone calls and questions! Shauna & Julie, I'll try to get the soaked recipe up soon, I'm still playing with it, (making more today), but may just post it while it's still "in-progress", because I'll probably *always* be playing with the recipe here and there. Yes, Shauna makes 100% whole wheat breads in it all the time and it does great. (She makes 6 loaves at once!) But she adds some gluten and hasn't tried soaking yet. I'm working on my recipe with soaking, no gluten and working up the amounts of whole wheat flour (and some spelt) every time I make it. I'm getting closer! 3. I use a Nutrimill to grind my grains, and that is also available at the same link above. I believe the Nutrimill even comes with a lifetime warranty. Does the Bosch handle 100% whole wheat well? I’m really tempted by this machine – it sounds great. Does it bake the bread or just mix/knead it? Also does it have a pasta maker attachment like the KitchenAid? I was thinking of getting the KitchenAid but now I’m leaning toward the Bosch. Also what do you use to grind your grains? Or do you just buy flour and soak it? Glad you did an article on the Bosch. I have had mine for 15 years and it still is as strong today as it was when I bought it. Looking forward to comparing notes on your soaked flour adaptation of bread recipes. I have a recipe from Marilyn Moll. Also, the blender pancakes are terrific–always a request around here. So easy to make and a terrific way to get different grains into the diet. Wooo Hoooo!!!!!!! I’m so glad that you love it as much as I love mine! I’m telling you, I don’t know how I managed before w/o it! It has truly made my “cooking from scratch” lifestyle much easier. They are expensive, but the way I looked at it, I saw it as an investment, and a TOOL for my kitchen. I would never go into debt to get one (we do the Dave Ramsey envelopes too, and save cash for things we want/need), but it it really worth the goal of saving for one! Can’t wait to hear how you soak your dough….. That’s the next thing I want to work on!